his brother did it would not by itself mean much if Seth himself wasn’t equally interested in such a challenge. And, just as was true with Taylor, not until his twelfth birthday did he give the green light to his mother. Turns out the pace was similar. Not until we were within days of his thirteenth birthday did he clear his last hurdle. When Seth was asked what he’d most like to travel to, he was succinct: “Islands and deep blue sea!” And just as was true with Taylor, his summer sports program was so demanding that we only had a three-to-four-week window to work with; consequently, that reduced our cruise options to a rather small number. We didn’t want to book a cruise that was a carbon copy of Taylor’s because we wanted Seth to feel that there were aspects of the itinerary that were his alone. In the end, we booked early, in order to get an advance rate, with a cancellation clause that permitted us to back out if Seth failed to complete his challenge in tine. We found a cruise on the Norwegian Spirit that played all the destination hits (from one end of the Mediterranean clear to the other). As we tested Seth, it didn’t take me long to discover that he was especially susceptible to side-trips beyond the required. In that, he reminded me of my own Grandpa Herbert Leininger, who’d always suffered from an incurable itch to find out what was on the other side of a given hill. He even expressed his own individuality in his written response to being sent a journal with the trip’s itinerary pasted in at the front of it, and symnopses of each day-trip we had booked. Thank you for dedicating the last 13 years to save up to take me on a journey of a lifetime. I can’t wait until then. We will have a great time. I wonder what the hotel room on the ship will look like. There are so many things I wonder what will be like. Can’t wait to see you guys. This time, Greg didn’t even try to surprise the new traveler. Of course, he wanted to go along. But no more cramming four people into one small stateroom; he booked an adjoining room for him, and we had Seth bunk with him. Both times, it was great to have Greg along. 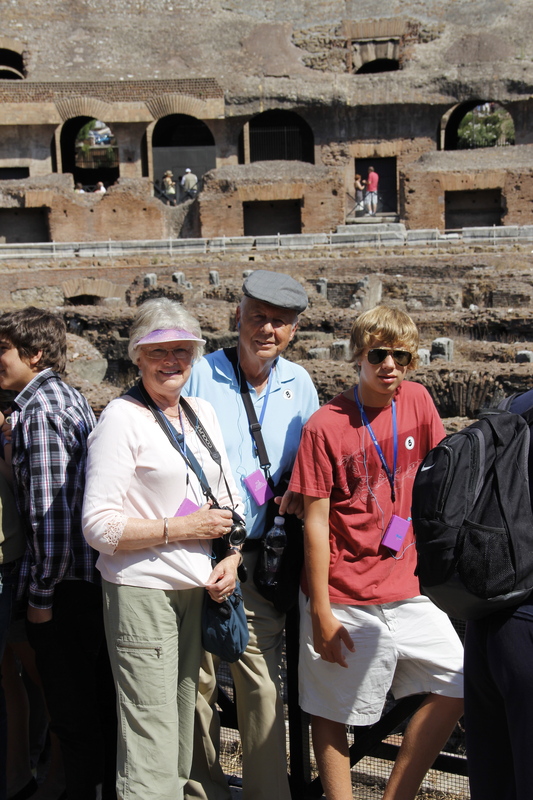 Of course, the whole purpose of both cruises was the opportunity, at least once in each grandson’s lifetime, to be able to give them our undivided attention. But even so, given that Greg was only one generation removed rather than two (our case), it gave both boys two generational options rather than just grandparent/grandchild. This time, we made the transatlantic flight without Greg, as he was flying straight to Munich in order to pick up a brand new BMW there. He later met us at the ship early afternoon of the sailing day. It didn’t take us long to discover that Seth had three obsessions: science, art, and sports. Words too: from someplace he inherited a love for words—individualized, like Ogden Nash, in his case. Rarely a day in which he failed to coin a new word. When we got to Gaudi’s Sagrada Familia, next day, after ten hours sleep, we had to wait in long long lines over an hour and a half just to get tickets—and then two more hours waiting to get in. It was truly amazing to see how much progress had been made in only three years. Of course, 25,000,000 people a year, each paying a hefty admission price, ought to result in progress! Later on, I was traumatized to discover that somewhere along the way I’d dropped three sets of very expensive bus tickets. We completed the day’s activity by a visit to the great Palace of Art on the hill. Seth was especially fascinated by the Gothic and Romanesque art. Next day, finally got into the magnificent Palace of Catalonian Music — hadn’t even been able to get in three years before. Then, check-out, meeting Greg at the ship, and we were on our way late in the afternoon. No storms this time. Two days later, in Florence, we lucked out with a much more effective and articulate guide than the one Taylor had lampooned three years before. I’ve discovered over the years that great guides can make a trip and poor guides wreck them. 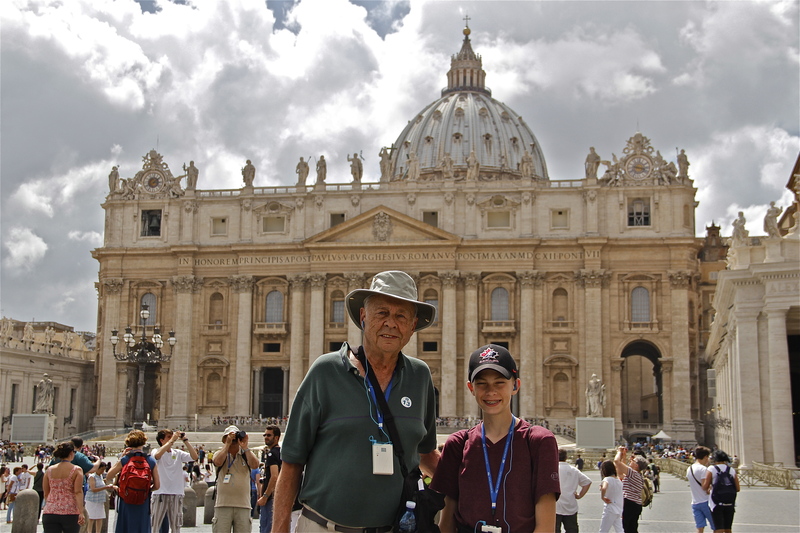 In Rome, we braved long lines in order to get Seth into Michelangelo’s magnificent St. Peter’s Cathedral. Next day, high up on the legendary Isle of Capri—first time ever for Connie and me—, by agreement, we separated into two groups of two. Almost disaster! Connie and Seth waited at the Clock Tower rather than the bus stop, so after waiting a time, the other bus passengers left for the fast ship back to Naples. The guide stayed with Greg and me. Finally, Greg was able to get through to Connie’s almost dead cell phone, and the guide put us on a separate bus. We just made the last ship back! Our Formal attire for dinner one night! July 9 – “Capri – O.M.G. Island with clear water. I took a chairlift to the top of the island. I’m still trying to take in the awesome view. It was so majestic. No journal entry for Athens and Venice. A pity. But Seth compensated for it on the last day of the cruise (almost every day he coins a new word): SHMECKLE – for thingees, words, or terms you can’t think of , or any word you want to substitute for. I had earlier suggested to Seth that he’d be protective of his Grammy as there are so many pickpockets in the crowded streets. He took me at my word, and almost invariably he’d be protecting one side of her, and expecting Greg or me to cover the other. For crowd-control purposes, each bus-load of people is given in advance stickers designating which bus to board for a designated tour. Seth delighted in later planting those stickers somewhere where we wouldn’t notice them – often on our back-sides somewhere. All too soon, we had to bid adieu to the Norwegian Spirit in Venice; Greg flew back to Munich to pick up his BMW for a few days before having it shipped home to him, and we boarded the plane for Philadelphia. 1. View from the Isle of Capri [just as Taylor fell in love with the nearby Amalfi Coast, Seth will most likely never ever forget the sight of the incredibly deep blue sea as seen from the ramparts of Capri]. 2. Sagrada Familia [like Taylor before him, he was overwhelmed by the interplay of light inside—it literally takes one’s breath away]. 3. Free Soft-Serve Ice Cream! [Seth gave Taylor a run for his money in his multitudinous raids on the poor ice cream machine on the ship]. 4. Venice. Especially the late afternoon gondola ride. 6. Hagia Sophia and Blue Mosque in Istanbul. 7. Soccer on the ship! [Everyone in Europe, it seemed, was riveted to the World Cup soccer play-offs; besides that, Seth played soccer on evenings or sea days, with other young people on the ship]. As to Seth’s post-cruise thoughts, he too has developed an apparently incurable case of travelitis. Any time we now go anywhere without him, he sulks. On Nov. 12, I’ll wind up this series on grandparenting, with some last thoughts and conclusions. In a way, Taylor’s cruise was a trial-run for Seth’s three years later, for Taylor’s re-introduced us to the minds, habits, and speech of a thirteen-year-old. I’d forgotten, for instance, how short a time instructions remain in their mental silos, and how constantly those instructions have to be reinforced. For I should have remembered from Charles Schultz’s immortal Charlie Brown movies how adult talk is received in their minds as so much “wah wah wah.” I mistakenly assumed that once I had thoroughly planted in Taylor’s mind the necessity of writing in his journal each day, he’d faithfully remember. Hardeeharharhar! Three years later, when I scrutinized his journal for the first time, I ruefully discovered that he quit after only five days! Even though I reminded him to write in it several times during the cruise. Of course, when even college freshmen have to be constantly reminded of such things, it was stupid of me to assume thirteen-year-olds would be any different…. Only belatedly did we realize we had taken so many photos of places we visited that we failed to realize how few of them featured Taylor himself! 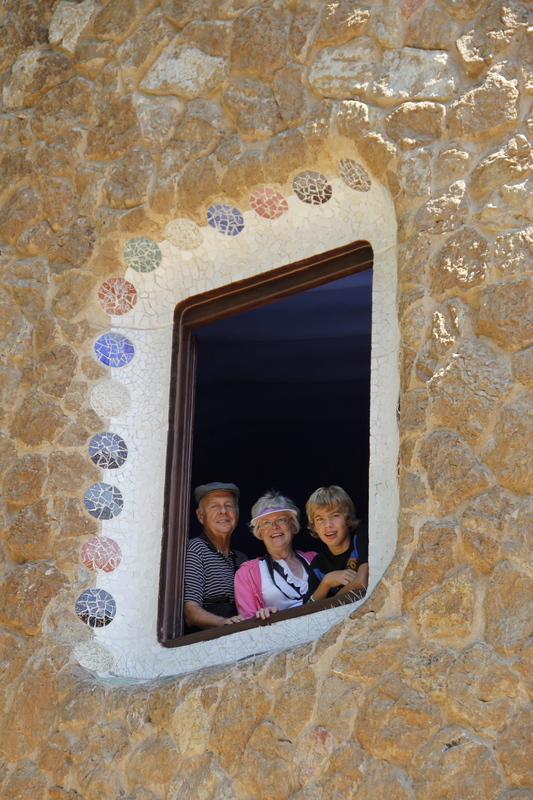 Visiting one of Gaudi’s Architectural Wonders in Barcelona. Finally, the big day arrived. By mastering the geography of the world, during the twelfth year of his life, Taylor had earned his personal dream Mediterranean cruise. But for us, the proverbial moment of truth had arrived. Connie and I now had a duly signed and witnessed power of attorney to be solely responsible for Taylor’s life during the two weeks he was with us. Such a responsibility is more than a little daunting. Much more so than having one’s grandson with us in the United States where most people speak English. For should he get lost in a foreign country, where the native language is not English, in great cities, often teeming with millions of people, and streets and byways our grandson has never seen before—what would we do? More frustrating yet, what would he do? What if some unscrupulous person should lure him away—and we’d never see him again? How could we ever have faced his parents with this perceived dereliction of our duty? Since our son Greg, an advertising copywriter from Fort Lauderdale, would be with us, and would, from time to time, have Taylor alone with him, what if he’d be lost then? That this is no light problem, let me share with you one of the scariest moments of the entire trip that took place at Barcelona’s Sagrada Familia. Millions of people live in Barcelona, and over 25,000,000 people from all over the world come here each year to see this almost mythical church [it’s not an operational cathedral] over a century in the making. It takes hours just to get inside its gates. Well, while inside, Greg and Taylor went shutterbugging in a different direction than Connie and I did. When I circled back and found Greg, Taylor was nowhere to be seen! Had this been San Francisco, Dallas or New York, I wouldn’t have been nearly as apprehensive. Initially, I assumed I’d find him quickly; when I failed to do so, each additional minute—each seeming like years!—that passed, my stress level skyrocketed. Here, there, inside the teeming edifice, I raced, then outside, but inside the gates, and everywhere masses of people—and no Taylor. I think I must have aged years during the mere minutes it took to find him, nonchalantly taking pictures. Oh the unutterable relief! And, at this juncture, the trip had not even started yet! At the Monastery at Montserrat. Later on, I thought of the parallel in Holy Writ, when twelve-year-old Jesus was lost in the great metropolis of Jerusalem—and his frantic parents searched three interminable days before finding him. With that preamble, let me back up a couple of days. Up until this day of departure, we’d kept Greg’s joining us on the cruise a secret. Taylor had not even an inkling that his beloved uncle would be sharing the two weeks with us. On July 27, we were scheduled to pick up Taylor in Annapolis, fly out of Baltimore to Philadelphia, where we’d change airlines and meet Greg at the gate of departure. That was the schedule; the reality proved far different! The reality was that not one, but two Baltimore to Philadelphia planes proved defective, thus placing our connecting flight to Spain in jeopardy. We, along with some other travelers in a similar plight, were rushed to our already checked-in luggage, then rushed to a waiting van, then a veritable Jehu of a driver risked traffic tickets by racing down the freeway to the Philadelphia airport. Surreptitiously, Connie texted Greg so that he and the gate attendants could keep track of our whereabouts and likely (if no traffic slowdown) projected time of arrival. With bare minutes to spare, we reached the vast Philadelphia terminal and were propelled post-haste through security. We just made it! 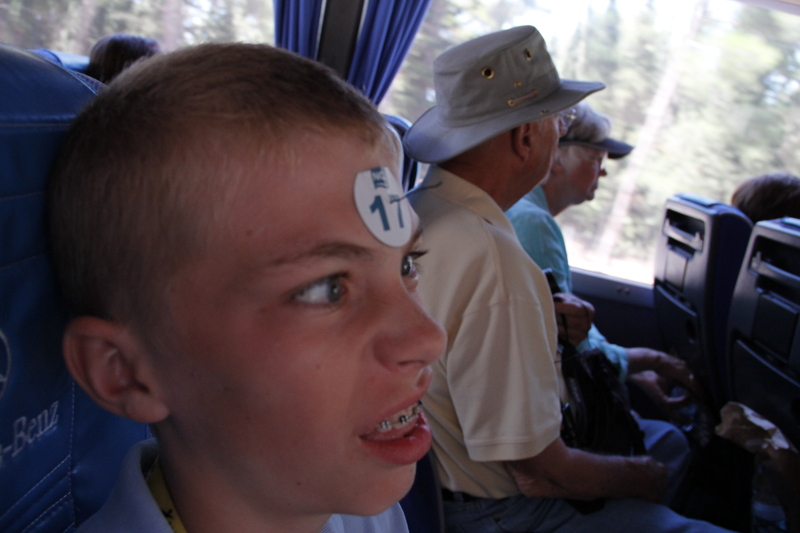 And the look of disbelief on Taylor’s face when he saw his Uncle Greg waiting for us in line was absolutely priceless! Worth every minute, week, and month of subterfuge it took to pull it off. We were next crammed into an oversized US Air jet like so many tightly-packed sardines. Very little sleep for any of us during the long trans-Atlantic flight. 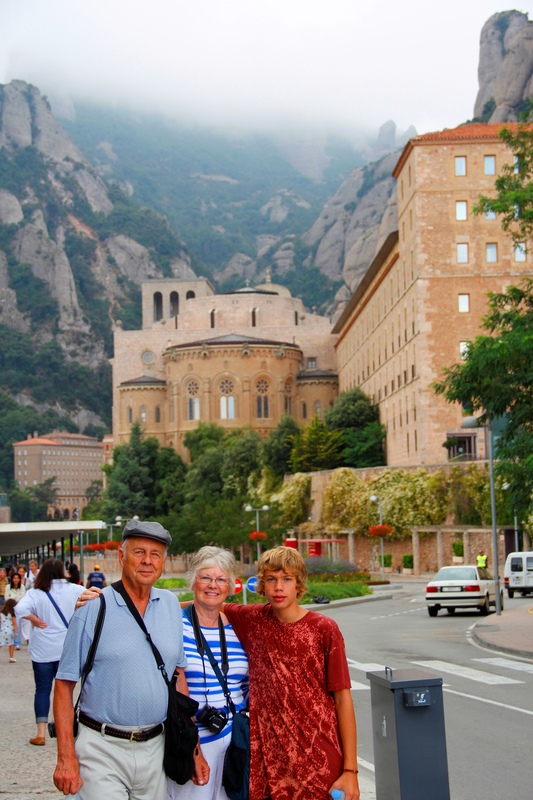 On July 28, we arrived in Barcelona, checked in at the Regina Hotel and, because we could not get in our rooms until afternoon, we took our pre-arranged bus trip to the mountaintop monastery of Montserrat. Believe me, when we returned from this jaunt, we found something to eat and we went to bed early, trying to catch up on the missing night’s sleep plus the missing eight hours on the clock. 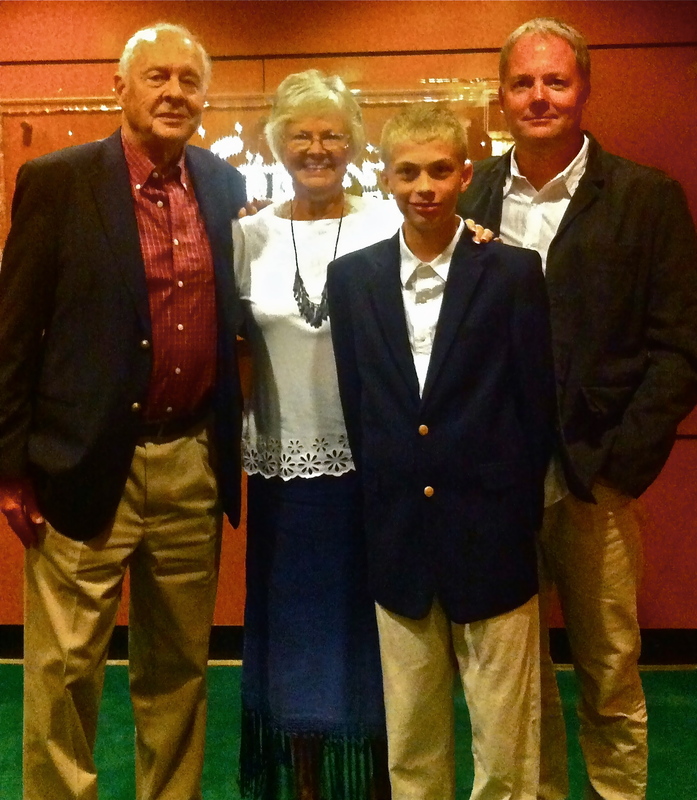 July 30 – We board Royal Caribbean’s Brilliance of the Seas and sail out to sea. August 12 – We board our plane and arrive in Philadelphia in the afternoon. It is fascinating to see the world (in his journal entries) from the eyes of a thirteen-year-old! 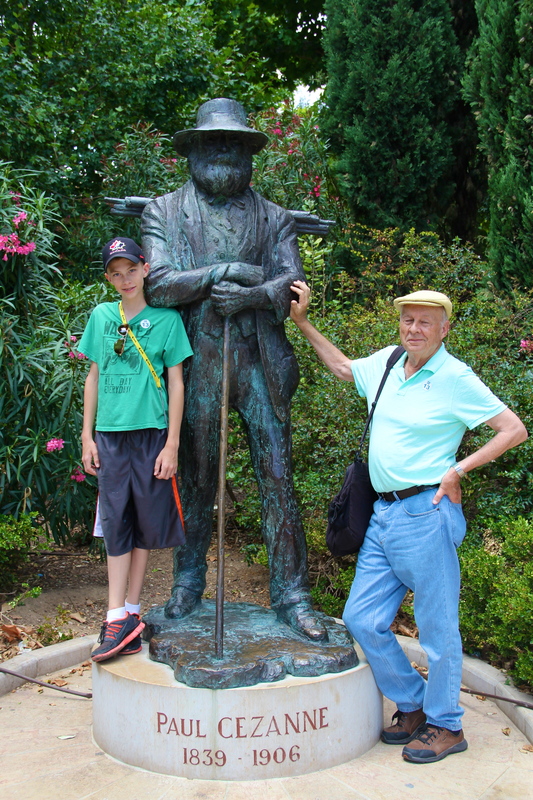 July 31 – “This morning we arrived at Nice. It was cool. We had to get up early though. Dang! We have to get up even earlier tomorrow. When we got to Nice we had to take a tender to shore. It was pretty cool but we didn’t sit up top which would have been even cooler. “Our tour guide took us to a place called Eze! It was really cool, there was an amazing view and there was this castle, church, or whatever. I think it also could of been a house and a hotel. Maybe all of the above. My face is still red from that Pisa experience. I had drummed this message [to stay together at all times—and never to separate one’self from the group] again and again into everyone’s head—except, obviously, my own. At Pisa, inexcusably, I wandered off, taking pictures. Some time later, when they were getting extremely apprehensive—had I experienced a heart attack or stroke? —, we found each other. Boy, did I ever get a verbal thrashing! Taylor will probably chortle about the difference between Poppy’s talk and Poppy’s walk until the day he dies! A little while after we returned, I asked Taylor if the cruise had made any difference in his life. 1. The Amalfi Coast [he was overwhelmed by the corkscrew road leading down through mist to the incredibly deep blue sea below]. 3. Monaco [he especially reveled in seeing the exotic Lamborghinis, Bugattis, Rolls Royces, Bentleys, etc.]. 4. Eze. [An ancient hilltop village in France]. 5. Strawberry virgin daiquiris [his favorite pool-side liquid extravagance]. 6. Soft-serve ice -cream machine [no small thanks to near constant visits to it, he gained over five pounds during the cruise]. 7. La Sagrada Familia in Barcelona. 8. Food! All the different food at all the different stops. 9. The storm [as we were leaving Barcelona and heading out to sea, a terrific Mediterranean storm blew out of nowhere, blowing deck chairs, people, and everything not nailed down, hither and thither. Taylor enjoyed most the sheer violence of it; got out in the open so he could take the full brunt of it. The authorities were not amused; they unceremoniously pushed him back under cover]. Next week, we’ll break from Grandparenting in order to get to Dr. Joe’s Book of the Month October selection. We’ll get back to Seth’s 2014 story on November 5.